Score diamond pattern on underside. Cook until white and curled,about 1-2 minutes. Combine all ingredients for sauce together in food processor or blender. Blend until onion and ginger are finely minced. Combine remaining ingredients in bowl and toss lightly. Toss cooked squid in sauce. Spoon any remaining sauce over squid salad. 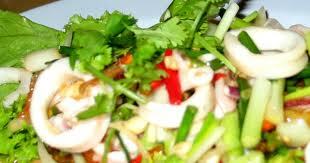 Serve squid salad at room temperature. Posted on October 5, 2012 by The Best RecipesPosted in SaladTagged bamboo, dinner, dry sherry, food, ginger, ginger sauce, green onion, onion, recipes, salad, squid. Sounds delicious ! I am thinking of adding this to my Christmas eve ‘night of Seven fish’ Hello number 8!